Today Quantum Mechanix has announced their first set of lithographs prints from the recent Star Trek movie. The first set of four prints will be based on early poster design concepts, as seen in the recent "Star Trek: The Art of the Film " book. The posters are available to buy now and will also be available at San Diego Comic Con. More details and images below. If you picked up the excellent "Star Trek: The Art of the Film " book last year, you would have seen a few pages at the end of the book showing off multiple design concepts for posters for the Star Trek movie, many of which even had the original release date of 12/24/08. Quantum Mechanix liked them so much, they are making a selection of them available for their first posters tied to the Star Trek movie. The first thematic sets of four 18" x 24" prints focuses on retro, WPA-style themes that were explored early on. As with all of QMx’s poster sets, the Star Trek Movie Poster Set, Series 1: Retro consists of plated-printed lithographs that come on 100-pound, aqueous-coated, satin-finish paper. All four prints for just $29.95. The posters are available now at the QMx site and will also be available at the QMx booth at San Diego Comic Con next week (Booth 3251). Earlier this year QMx released a series of four Star Trek movie badge replicas, which cost $9.99 each. You can buy them at Entertainment Earth (click images below to buy). 1st and 3rd are interesting. “Boldly Go” would be an excellent name for the next movie, btw. Nice posters, just picked up a set! I agree “Boldly GO” or “To Boldly GO” would be nice title!!! Boborci if you see this tell me your thoughts! These posters are incredible. Wish I had a credit card (and some space on my walls) so I could buy them. I’m going to need to find me a man-cave. We commissioned these types of posters early in the marketing process when we were pondering using a kind of RECRUITMENT CAMPAIGN for people to join Starfleet. The artists who made them out did themselves, in my opinion. I think they are gorgeous. 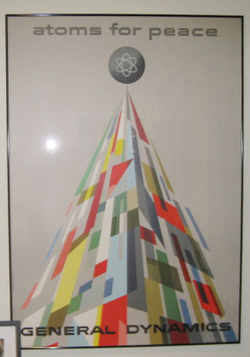 They seem inspired by a mix of these general dynamics posters from the 50’s and 60’s (which we have hanging in our office), which tout atomic power as a benevolent force for the future. and of course the classic recruitment posters during World War 2. Boldly Go would be a good title! They look wonderful, although to me they smack more of communist / cultural revolution-esque Red Army posters rather than 1950s/60s (UK, at least). Probably due to the colour scheme – weren’t western posters at that time generally more colourful? Here black, red and dystopian white-fading-to-beige seem more prominent. Striking: yes. discovery/adventure: no. Of course, the Federation is in many ways socialist, but it was an enlightened socialism, not a passionate ‘patriotic’ (lacking any more applicable description) one. Ideology for a reason, not ideology because of loud noises. Will they still have release dates on them? I think they would look cool if the dates were left off. Nice title, “Boldly Go” I like these posters over the black and white ones released. I just ordered mine:-) I think they will be a fine edition to my Star Trek wall… well… walls. Nice. Thanks for the tip, AP. I mentioned that trekmovie.com sent me when I ordered my set. I seem to remember Pixar doing some retro posters like these for Up and Wall-E a couple of years ago. Would it have been so hard for them to update the date on these to the actual release date? The wrong date will probably make them worth more in the long run. Like those coins with the wrong year or the buffalo pointing in the wrong direction. Is it possible that these would be sold in Vegas? As I would love to buy one, and that’s the only convention I’m headed to in awhile. Again, I’m telling you guys, the Federation is a classic post-scarcity technocracy, not socialist or capitalist. These look great, but when is QMx going to release their nu-Enterprise replica? Actually yes, silly me, you’re right, and trek is all the better for it. My momentary lapse in clear thinking, that’s all. Still stand by the rest of what I said though. Star Trek design and art has always been a statement unto itself. Other people copied them. Between the T-shirt cartoon Kirks & Spocks and now this- the legacy of Matt Jeffries, Gene Roddenberry, and all the rest is seriously diminished. Besides, Neo-Sovietism isn’t exactly in keeping with the spirit of Star Trek. Neo-Sovietism is probably just one more thing introduced to century 23 when this B.S. alternate Abrams reality was created/vomited forth. 11- I agree, no dates, or if so, how about the real date the movie came out??? 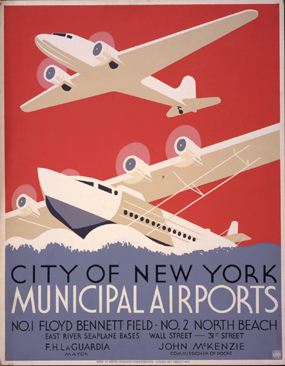 The posters — which ARE gorgeous — are strangely appropriate in that, to me, they evoke the Great Depression era (WPA). And in 2009 and 2010, with the economy the way it’s been — well, you know. I’m not really sure how the economics of the future work, but I do know I identified with the Ferengi much more than the Feds. Profit through manipulation and exploitation I understand; bettering myself through realigning plasma coils or networking a few tricorders together to bypass a computer core invested with nannites–sorry, Geordi, I’ll stick with capitalism. @ 29 so if inflation stays constant, a tricorder would cost about what? 30-40 Million? Capitalism will fail, i’m not against it by any means, but its very nature is flawed, as is communism or any other societal structure we’ve designed so far. End of rant. No system will work in the long run because we are human, to error n fail is to be human. QMx has given us badges and posters. Big deal! What about the Enterprise model promised well over a year ago???!!! The first would fit nicely with my Obama posters. Reminds me of the NYK Line posters by George Hemming. They would be better if they added more colour though…looking forward to the next set. love each of those designs, will they be available to UK customers like the pins are through Forbidden Planet and Play.com? I like the designs but I think the choice not to use them was probably the correct one. They are just too old fashioned looking. They are more Buck Rogers than Star Trek. ah Normadie. Now that was a beautiful ship. I can see why they weren´t used, they´re way too smart for the regular crowd to “get” the joke. It is a glorious constructivist work. This is fine, but where the heck are the starships they promised us? 43. You’re not wrong. Shame she went to such a waste but she, along with Cunard’s Lusitania, are probably the two most elegant to have ever displaced water. I was always a fan of Cassandre’s work too. He’s probably one of the biggest influences on the art deco movement, which was an aesthetic I just love. Have always loved the WPA poster. Have about 5 of them. This is my favorite. Absolutely love the ST posters. Great stuff!! The 4th one looks like it is purposely “distressed”. Wonder why? And I especially wonder why they contemplated using TOS Enterprise to promote the 09 film. Had they originally contemplated using that design for the film? Maybe Bob would know…? Speaking of ships, everyone remembers the Titanic, but fewer remember the RMS Olympic, one of two of her sister ships, or the largest of the Olympic class, the Britannic, which sank only after a year of service. Ocean liners today are in some ways more luxurious than ever. One of example of modern ships that ply the oceans is the Queen Mary 2, an ultramodern, 148,000-ton behemoth that dwarfs the Titanic. So the idea of the Enterprise-D as some kind of luxoliner really has quite a long history. The nuEnterprise has yet to be fully shown; we’ve seen a few spaces, notably the futuristic bridge, the somewhat retro engine room, the medical bay, and the ship’s corridors. Still to be shown, for example, are the officers and enlisted cabins, the mess hall, or any recreational area. One could theorize that there are green spaces on board, re-creating parkland areas on Earth. I believe that some of the Franz Josef-era blueprints for the TOS Enterprise incorporated a similar feature.